Dive into design and get a certification to prove your expertise. Adobe applications are still the gold standard for designers after all these years. These are the tools you'll absolutely need to know how to use if you want to get work as a graphic designer, and you can master these programs with Graphic Design Certification School. Get it on sale for 96% off the retail price! You're going to need to have at least some familiarity with Adobe products if you want work as a graphic designer. 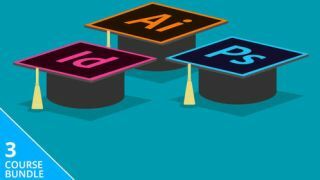 The Graphic Design Certification School will teach you how to make the most of Adobe's powerful design tools – including Photoshop, InDesign, and Illustrator. You'll get tons of actionable lessons that will teach how to take your ideas and bring them to life on screen. You can also get certifications to prove your skills after each course you complete! The Graphic Design Certification School is valued at over $1,197, but you can get this incredible bundle of courses on sale for 96% off the retail price! That means you pay just $39 (approx. £30) for a bundle that will help you improve and certify your skills, so grab this deal today!